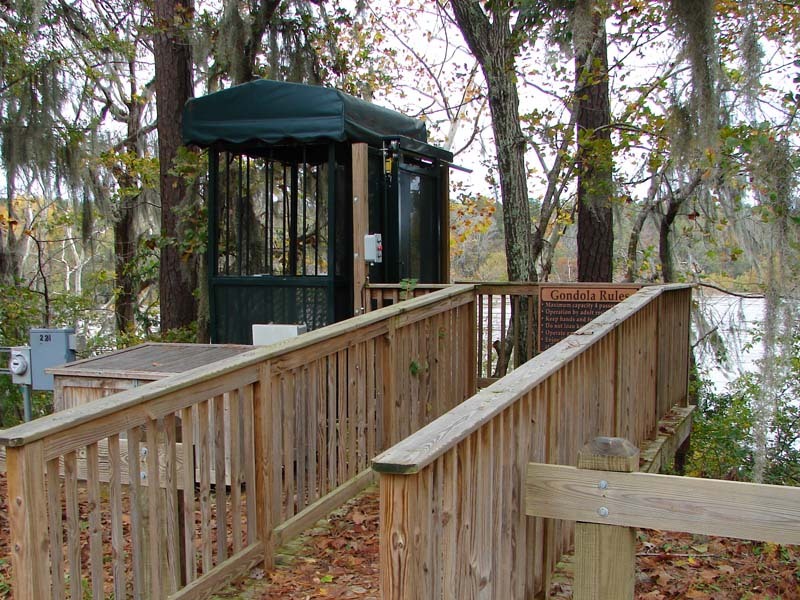 Inclined elevators, also known as funiculars, hill lifts, hillside trams or outdoor elevators, are most commonly used in residential lake home applications. They also have a great value for commercial applications. Keep reading to learn about the commercial uses of an inclined elevator. If your business is located on a hill or has areas with steep hills, you might benefit greatly from an inclined elevator. Your customers are looking for enjoyment and relaxation. Unhappy customers might not be back, so customer satisfaction drives your goals and profits. Generally, customers aren’t excited about climbing stairs or hiking up hills. Give your customers a luxurious, smooth ride. Their satisfaction will deliver you rewards. Restaurants – Your diners park on road level and take your fine stairs through the beautifully manicured landscaping to your deck or dining room. Maybe they walk from your dock up to the main level. Imagine not worrying if a diner has a bad knee, is a little wobbly from a recent surgery or maybe in the early onset of Parkinson’s Disease, with an inclined elevator, your customers are safe and comfortable. Golf Courses – Most of your golfers are driving carts, but you still have some that want to walk, for the exercise, relaxation or the spirit of the game. Drive up your customer satisfaction with your walking golfers. When they get to that steep rise up to your beautiful, signature tee box, they can ride the safe, relaxing inclined tram rather than walk around the beautiful path. This will speed the play of walkers and give them an added level of satisfaction. Condo Associations/HOA/Retirement Communities – Does your property have stunning views because of your elevation? Maybe this leaves parking or amenities located up or down a steep grade. The stairs may be acceptable for some residents, but maybe others need a little help getting to all parts of the property. Maybe the internal elevator doesn’t quite deliver people to the correct exterior level. An outdoor inclined elevator will make all of your amenities accessible and keep all your residents involved, entertained and excited. 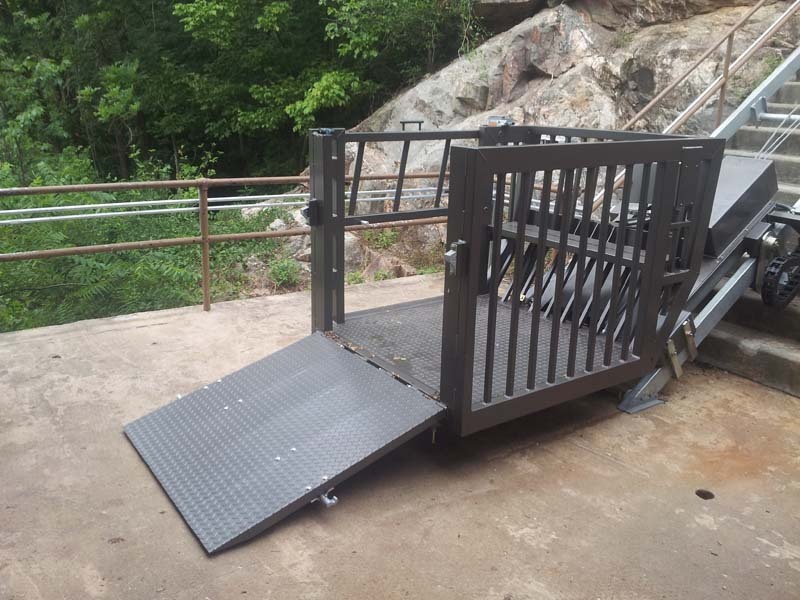 The addition of an inclined lift is also a great sales feature to help convince potential residents with accessibility needs that your facility is concerned about their well-being and enjoyment. Government / Industrial – Maybe your needs are not with a customer-focused business, but a government or industrial entity. An inclined lift could be the solution to your current issues. Inclined elevators have been utilized for moving personnel, equipment and supplies in power generation, water production and manufacturing facilities. 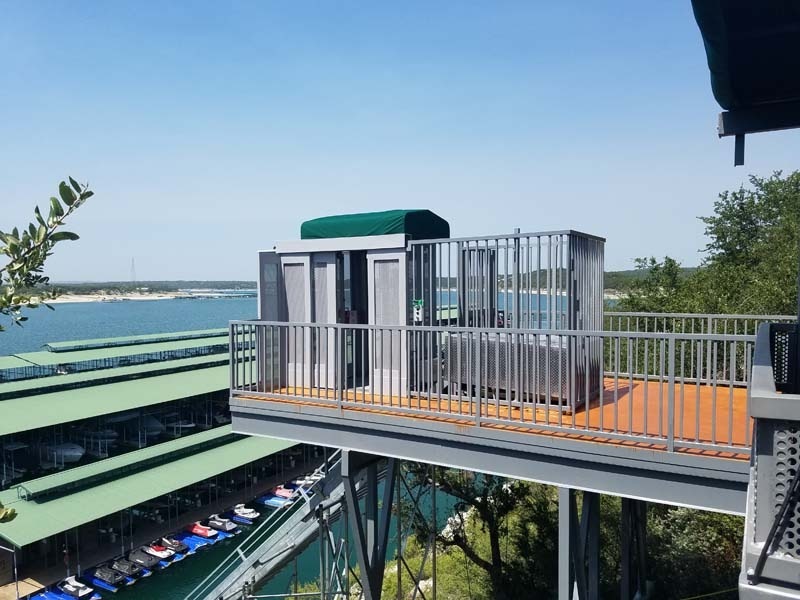 Being engineered for exterior use in the harshest conditions, an exterior inclined elevator will stand up to many interior applications involving high humidity or temperatures, freezing cold or salt-water conditions. The lift could be a personnel lift on the job site, an advanced material transportation system or a combination of personnel and material. The system requirements can easily be adjusted to suit the needs of almost any use. 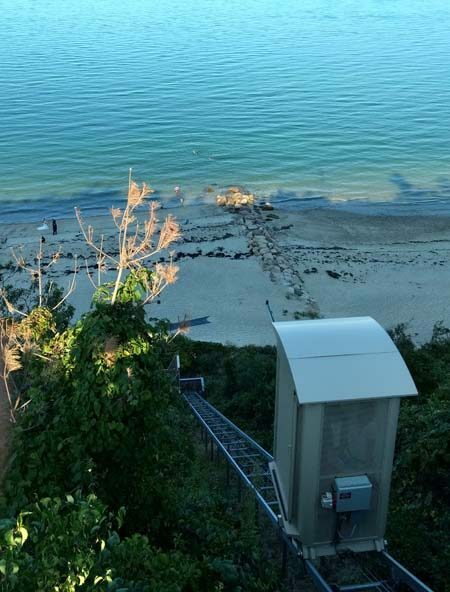 Don’t just think of an inclined elevator as a lake home luxury, but it can also be a tool to help you do your job, no matter if your job is managing an industrial facility, a condo association, a restaurant, golf course, marina or resort. An inclined elevator can help you move materials, transport employees or increase your customer satisfaction. Contact us today to learn how and inclined elevator can improve your business! Are you ready to take the next step to help your business grow? Contact us for a free quote today.